In what can only be described as an unusual move by General Motors, the 2014 Chevrolet Camaro SS made its world debut on Live with Kelly and Michael – giving us a great look at the refreshed Chevy muscle car ahead of tomorrow’s debut at the New York International Auto Show. Luckily, for those who didn’t watch the show, the Kelly and Michael website has the first official General Motors image of the refreshed 2014 Chevrolet Camaro SS – which we have enlarged (hence the poor quality) and included on the right side. The changes are along the lines of what we expected but the 2014 Camaro facelift is a bit more expansive than we first expected. The 2014 Chevrolet Camaro front fascia is vastly redesigned with a narrower upper grille opening that tapers down as it reaches the central Chevy bowtie badge. The way that this new grille flares as it extends out gives the 2014 Camaro a very angry, scowling look and while it isn’t extensive – it should be enough to rekindle consumer demand in the three time reigning sales champion of the muscle car class. The lower front fascia has also been changed significantly with a large central vented area departing a ton from the smallish opening in the current (2013) Camaro while the fog lights are now mounted in larger square bezels where the current model fog lights are mounted in very minimal bezels. This lower front fascia is shown here on the 2014 Camaro SS but we suspect that the entire 2014 Camaro lineup – bringing a bit of ZL1-like styling to the full Camaro family. Finally, the front end of the 2014 Camaro SS features a heat extractor mounted in the center of the raised section of the hood. What we cannot see in this sole image of the 2014 Chevrolet Camaro SS is the revised rear end which features vastly different taillights from what is found on the current Camaro – or any generation before. As I predicted almost a year ago, the 2014 Camaro features a taillight design that is very similar in the basic shape to those found on the current European Camaro and the 2011 Hot Wheel Concept with a larger single lighting unit located on each side with contour along the bottom splitting this larger unit into two distinct lenses. The inner portion of the taillights are different from what is used on the European models but the overall single lens design is more like the Euro Camaro and the new 2014 Corvette Stingray. When I first questioned the possibilities of a European style, one unit taillight lens on the 2014 Camaro we got a bunch of nasty emails and comments from the Camaro enthusiast world about how I didn't know what I was talking about. Perhaps it is time for some of those know-it-all Camaro fanboys to eat some crow? Click here for a look at my prediction that the 2014 Camaro would use a European style taillight made back in June 2012 along with some of the nasty comments based on my prediction. Update: With the Wednesday debut of the 2014 Camaro SS and more images from GM, we have replaced the blurry shot from the TV show website along with attaching a gallery of images. Click any thumbnail on this page for a closer look at the 2014 Camaro SS. 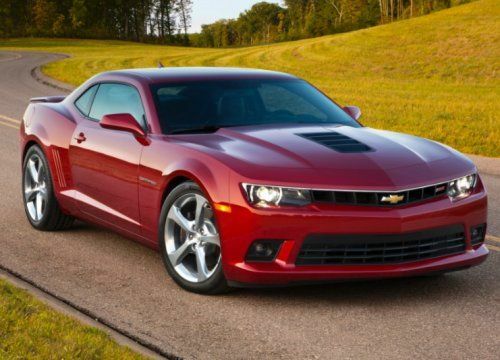 Also, click here for a look at the incredible new 2014 Camaro Z/28! One surprising piece of information that accompanied the Live with Kelly and Michael debut of the 2014 Chevrolet Camaro is that the power output will remain unchanged for the refreshed Camaro. The 3.6L V6 will still offer 323 horsepower while achieving 30mpg on the highway. The Camaro SS will still come with a 6.2L V8 offering 426 horsepower while the Camaro ZL1 will still offer 580 horsepower. These figures are surprising as Chevrolet has been teasing the “performance enhanced” 2014 Camaro so either the numbers from Kelly and Michael are incorrect – or GM will enhance the performance of the new Camaro in some other way. With the formal debut of the 2014 Chevrolet Camaro less than 24 hours away, we should soon have a very complete picture of the refreshed Camaro but in the meantime, the image above on the right shows the majority of the changes included in the 2014 model year refresh. Check back to TorqueNews.com for more on the debut of the 2014 Camaro along with all of the other top news from the 2013 New York International Auto Show. It looks... like a fat guy sat on it. Although it may be felt that the "front fascia is vastly redesigned" and the taillights are vastly different, I would describe the overall difference in the two bodies to be rather "subtle" changes. I do like it better,however! Put an "SS" in place of the bow tie and it would really look sharp.